Up until a few months ago, I wasn’t a very big fan of Samuel Adams. While their Boston Lager is a respectable beer, I’ve never loved it. That all changed when I tried the Noble Pils and the Latitude 48 IPA. Those two beers impressed me so much, that I am now on a mission to try as much of their line-up as possible. While I haven’t loved all of their beers, I’m keeping an open mind and giving them all a fair chance whenever I have the opportunity to try them. I never knew that Samuel Adams had an Imperial Series until I read a review of this beer by Kim of “Kim and Tonic”. When I read the part about this beer reminding her of smoky Islay whiskies, I knew I just had to find it. Appearance: Dark walnut color with a deep red tint when held up to the light. Thick one inch head that dissipates slowly. Very little lacing left on the sides of the glass when you drink it down. Aroma: Rich roasted malt. You can definitely smell that peaty, Islay whisky aroma that reminds me of Lagavulin 16. I confirmed this by sniffing a bottle of this glorious whisky, which I just happened to have on hand. Taste: Fizzy carbonation that tingles the taste buds. Starts off with that sweet malt flavor. The alcohol and smokiness kick in towards the middle, leading up to a pleasant and warming finish. Regarding the ABV, Kim was right on the money, i.e. this is a deceptively smooth beer. I would have never guessed that it had such a high alcohol content. This tells me that Samuel Adams has taken great care in creating this beer, and that they have allowed the alcohol to become fully incorporated, so that you don’t get that “Whoa! That’s a really strong beer!” reaction (this has happened to me with a few Imperial beers that I’ve sampled). While I wasn’t overwhelmed by the smokiness of this beer, I can definitely taste it. 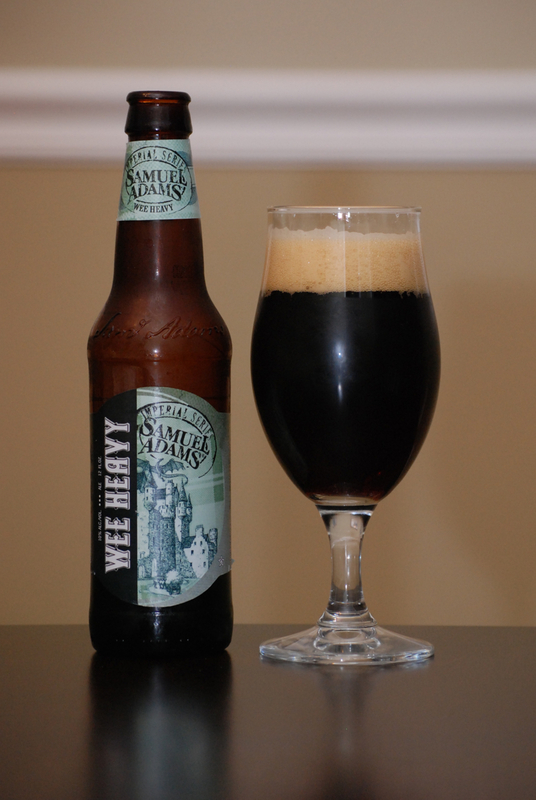 Overall, I really enjoyed the Samuel Adams Wee Heavy, and am looking forward to trying some other Scotch Ales/Wee Heavies to see how they compare. I happen to have a bottle of the Stone/Green Flash/Pizza Port Carlsbad Highway 78 in the fridge, so this comparison will probably happen sooner, rather than later. Sounds like you liked it! I enjoyed how much less sweet it is than a lot of Wee Heavies – the alcohol level in a Wee Heavy usually makes it a super-sweet, hot sort of beer. The peat smoke really helped this one, I thought. I did like it! It may have been my first Scotch Ale, so I wasn’t sure what to expect. I like Scotch. I like Ale. How bad could it be right? Turns out it was very very tasty. Thanks again for the heads up on this beer! Ok, Ok, this non-Sam Adams fan will keep an open mind! Good man! Not gonna know if you like a beer until you try it. You know my thoughts on ABV, but I may have to trust your judgement on this one. Thanks for the review! You’re welcome Tiff! It was a tasty brew for sure. Not something I could drink alot of, but I wouldn’t turn it down either. I love the Wee Heavy! Such a delicious Scottish style beer. If you haven’t tried it, Samuel Adams has a delicious Chocolate Bock too! It wasn’t well received. You can’t like em all. The Wee Heavy is another story all together. Twas a tasty brew! Wookie no like Chocolate Bock. Awww… I quite enjoy the Chocolate Bock. Then again, I enjoy Chocolaty beers. The Sam Chocolate is not as good as the Southern Tier Choklat, but me likey! I’m not opposed to a chocolate stout, but the Sam Adams version just seemed kinda watery, and the chocolate didn’t feel like it was incorporated into the beer. Hey G-LO – I had this beer before, and I had it again tonight just to make sure I remember it right. You know I’m a huge fan of sippers, and I’m an even huger fan of Wee Heavy’s. One of my all time favorite styles, smooth, malty, mildly sweet, full flavored but not too heavy. Its a style I could drink continuously and be very happy. With that said, I didn’t care for this one. I thought it was over the top heavy and actually a bit rough. Granted, it smoothed out some as it warmed, but the finish left more of a bitter band-aid taste that I didn’t care for. Just my opinion. I prefer an Oskar Blues Old Chub. I’m glad you enjoyed it though. Sam Adams does make some of my favorites, this just wasn’t one of them. It sounds like you have alot of experience with Scotch Ales. This is my first, so I don’t have much to compare it too. I definitely took my time and savored it. It packs a wallop! I’ll keep an eye out for the Old Chub and report my findings once I track it down. Actually G-LO, I think your whiskey background is more useful for this beer since that’s the character they’re going for. As for the band aid taste (no I don’t eat band aids – but if you tasted it, you’d know what I’m taking about), I wonder if I have an off batch. Apparently that’s a common taste when contamination sets in. Always learning something new about beer! A funny thing happened along the trail of my longstanding brewmance with Stone….. I searched all over Scottsdale, AZ the week of their release of Highway 78 to no avail. A couple months later I found a bottle locally and poured it a few days later expecting it to be the best Scotch Ale I’d ever had. No such luck. Very underwhelmed. Then came the funny thing. I had a bottle of Sam Adams Wee Heavy and was shocked. It is a much better, richer, creamier and more flavorful Wee Heavy than Highway 78. Still not my favorite Scotch Ale though. That one remains Three Floyds Robert The Bruce. Sadly, ever since they stopped distributing any of their beers outside of Indiana I haven’t gotten my hands on one. I don’t know about you, but I have found that life is all about expectations. If I keep them too high, I’m usually disappointed. Too low and I’m pleasantly surprised. That being said, I’m thinking that I will probably like the Highway 78 more than you did, simply because you’ve deflated my expectations. We tend to have similar impressions of beers, so I’m looking forward to giving the Highway 78 a try. Then allow me to re-inflate them a bit…. I had Highway 78 on tap at The Pourhouse during the Stone Tap Takeover and it was much better than the bottled version. Flavors were essentially the same but the mouthfeel was much creamier. Should I be thanking you for that?